Ryu-oh or Ryūō (竜王, lit. "Dragon King") is the name of a promoted piece in shogi, a Japanese professional shogi tournament, and the title of its winner. 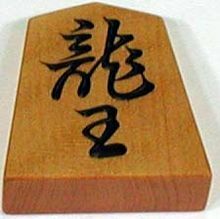 The basic meaning of "Ryu-oh" is a "promoted rook". It can move as either a rook (hisha 飛車, lit. flying chariot") or a king (gyokushō 玉将, lit. "jade general") during a turn, and is one of the two most powerful pieces in shogi. "Ryu-oh" also refers to the annual Ryu-oh Tournament (Ryūō-sen 竜王戦) sponsored by the Yomiuri Shimbun as well as the title awarded to its winner. The Ryu-oh Tournament, which is one of the seven major professional shogi title matches, was first held in 1988. It comprises preliminary tournaments in six classes and one final. The final tournament, which determines the challenger, involves competitions among eleven players (the top five players from 1st class, top two from 2nd class, and the top four from 3rd, 4th, 5th and 6th classes). The first player to win four out of seven championship games becomes the new titleholder. This title should not be confused with that of "Amateur Ryu-oh" which is awarded each year to the winner of the Amateur Ryu-oh Tournament. Cash prizes are ¥32,000,000 for the winner of championship and new Ryu-oh titleholder, and ¥8,000,000 for the loser (approximately US$320,000 and $80,000 respectively). Additional compensation includes ¥14,500,000 for the previous titleholder and ¥7,000,000 for the challenger (approximately US$145,000 and $70,000). Among the seven titles in the professional shogi titleholder system, Ryu-oh and Meijin are the most prestigious ones. "Lifetime Ryu-oh" ("Eisei Ryu-oh") is the title awarded to a player who wins the championship five times in a row or seven times in total. Active players may qualify for this title, but it is only officially awarded upon their retirement or death. The only player to qualify for the Lifetime Ryu-oh title to date is Akira Watanabe; Watanabe qualified for the title by winning his fifth championship in a row in 2008. He will be officially designated as "The First Lifetime Ryu-oh" upon his retirement or death. The first game of each of the following Ryu-oh title matches was played outside of Japan.